Father Marc Gervais, S.J. (Society of Jesus), a celebrated film scholar and much-cherished Concordia professor for four decades, passed away March 25, 2012, at the René Goupil Jesuit Infirmary in Pickering, Ont. He was 82. Whether rubbing shoulders with cinema nobility in Cannes, France, smoothly impressing on the tennis court, or wowing students in class with his extensive film knowledge, charm, humour and sense of style, Father Gervais confounded the image of a Jesuit priest. He was born in Sherbrooke, Que., in 1929, the second child of Sylvia Mullins and Superior Court Justice Césaire Gervais. He was raised in a thoroughly bilingual household, where he was first introduced to the world of movies. In 1950, Father Gervais graduated with a bachelor of arts from Loyola College, one of Concordia’s founding institutions. He then started the 13-year program to become a Jesuit and was ordained in 1963. Along the way, he earned a Master of Fine Arts in Drama at the Catholic University of America in Washington, D.C., in 1960. He added “doctor” to his titles when he completed his PhD in film aesthetics at the Sorbonne in Paris in 1979. In 1967, Father Gervais joined Loyola College’s fledgling communication arts program, now the Department of Communication Studies, and stayed until his retirement in 2003. He continued to teach film and religion at Concordia for the next several years. It was in the 1960s, when Father Gervais honed his understanding of cinema, that he became a regular at the Cannes Film Festival. Indeed, he took part each May for nearly 40 years. In his courses, which covered Alfred Hitchcock, silent-era Hollywood, 1920s Germany, John Ford and many others, Father Gervais brought a wealth of knowledge as well as his particular style and wit. “Marc had a special way of communicating with students. He loved what he was doing, he loved being around students, and that came back to him in droves,” says Don Taddeo, BA 67, a former communication studies colleague who remained friends with Father Gervais. The two also served together on the Loyola Alumni Association board of directors. “He was a pillar of the early communication arts program, and a humanist in every way,” Taddeo adds. Although his film expertise was vast and he wrote a scholarly book on Italian director Pier Paolo Pasolini in 1973, Father Gervais held a special place for the late Swedish auteur Ingmar Bergman. 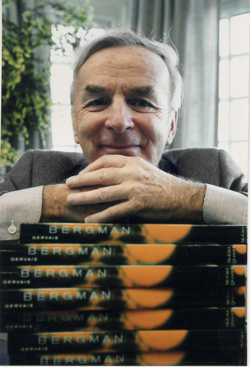 “He is a figure in cinema who revealed to us that film can be a voice in culture, like any great art,” Father Gervais told Concordia’s Thursday Report in 1999, the year he published Ingmar Bergman: Magician and Prophet (McGill-Queen’s University Press). Father Gervais played important roles outside the classroom as well. He helped establish the Lonergan University College (1975) and Loyola Jesuit Institute for Studies in International Peace (1988) at Concordia. From 1981 to 1986, he was a member of the Canadian Radio-television and Telecommunications Commission. He also consulted on several Catholic-themed films including as Agnes of God (1985), The Mission (1986) and Black Robe (1991). Father Gervais is survived by his brother, P. André Gervais, L BA 64, former chair of Concordia’s Board of Governors, and his sister, Constance M. Moisan. 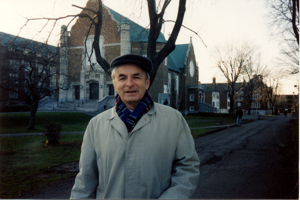 Anyone wishing to contribute to the Marc Gervais Prize in Communication Studies in Father Gervais’ memory may contact Maggie Borowiec at 514-848-2424, ext. 2093, or maggie.borowiec@concordia.ca. Gifts can also be made securely online. Under “Gift Information” and “I would like to support,” choose Marc Gervais Prize in Communication Studies. When: Wednesday, March 28 from 7 to 9 p.m., wake service at 8 p.m.
Where: Chapel at Manresa Retreat House, Pickering, Ont. When: Thursday, March 29 from 2 to 4 p.m. and from 7 to 9 p.m.
Where: Loyola Jesuit Hall and Conference Centre, Loyola Campus (7141 Sherbrooke St. W.), Concordia University, Montreal, Que. When: Friday, March 30 at 11 a.m.
(7141 Sherbrooke St. W.), Concordia University, Montreal, Que. When: Saturday, March 31 at 2:30 p.m.
Concordia recently lost two other members of the community: Morrel Bachynski and Father Stanley P. Drummond.